This general guide aims to give practical support and information to relatives of patients who have been admitted to the Intensive Therapy Unit (ITU). 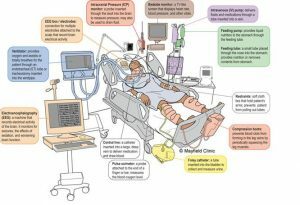 ITU can be known as Intensive Care Unit or Critical Care Unit. An Intensive Care Unit is specifically staffed and equipped to provide care for patients suffering from life-threatening or potentially life-threatening illnesses and conditions. Sometimes beds in ITU can also be used to offer high dependency care, for those patients who require less monitoring or treatment than ITU patients, such as after major surgery or when a major surgical procedure is carried out on a patient who has a number of medical problems in the background. The ITU is run by a specialised team of doctors and nurses who have undergone extensive training in intensive care. In addition, other members of the multidisciplinary team include: physiotherapists, radiographers, pharmacists, a psychologist and speech language therapists amongst others. Some admissions to ITU are planned, for example after a major surgery. However, most admissions occur in emergency situations. You may have arrived in hospital while your loved one is being assessed and admitted to ITU. Thus let the staff know of your arrival. A member of staff will let you know what is happening as soon as possible. You will be asked to wait in the waiting area outside ITU and once the initial assessment is made, you will be able to see your loved one. The staff will ask for the contact details of close relatives, in order to be able to contact them should the need arise. The length of stay of a patient in ICU depends on his/her severity of illness and may range from less than a day to several weeks. Monday to Sunday from: 11.30 – 12.00 & 17.00 – 18.00. In special circumstances, such as a newly admitted patient or when a patient is very ill, relatives may be able to visit outside these visiting hours and stay next to their loved ones. Please ask the ITU Charge nurse for more information. A maximum of 2 visitors are allowed at the bedside at any one time, unless special permission is granted by the ITU Charge nurse. Children below the age of 16 are allowed during visiting hours as long as they are accompanied by an adult. Staff may occasionally ask you to leave the patient’s bedside in order to carry out necessary medical procedures. Visitors are advised not to stay too long near the patient and should not enter the ward if they are sick. Prior to bringing any food or drinks for the patient, seek advice from the staff. Visitors’ mobile phones should be turned on vibrate. It is not allowed to take photographs of patients. Relatives are encouraged to ask doctors in ITU for information regarding the progress of their loved ones. Occasionally, this may not be possible immediately, so inform the nurse caring for the patient and one of the doctors will answer your queries as soon as s/he is available. The caring nurse may also help, should you need further clarification. The family of the patient can nominate one person to act as the contact point between the family and the medical and nursing team. This ensures that all family and friends are aware of their loved ones’ condition as well as helps to safeguard patients’ confidentiality. Patients require sedation to be able to tolerate some of the ITU treatment. The level of sedation depends on the patient’s requirements. Most relatives want to know whether they can talk or touch their loved one. This is usually encouraged. However, there may be special circumstances when it is better that the patient is not stimulated or disturbed, so you may be asked to refrain from interacting with your loved one. When in doubt, do not hesitate to ask a member of staff. In ITU, there is very limited space for storing property and therefore we ask that the patients only have essential toiletries. Money and other valuable items e.g. jewellery needs to be taken home by accompanying relatives. In case of unaccompanied or unconscious patients, these items are locked away safekt until they can be retrieved. While a friend or relative is in ITU you might consider keeping a day-to-day diary of what has happened during the day, including visitors who came, any procedures undertaken or updates. This will give you something positive to do and may benefit the patients at a later date. In fact, most patients eventually like to know of their ‘lost time’ in ITU. You might want to bring the patient’s favourite music and a pair of headphones or a DVD player and DVDs. Fear of the unknown may make an already stressful situation worse. Thus, do not be afraid to ask us questions if something is bothering you. Some relatives find it helpful to be more hands on in caring for the patient. You can help if you wish to by carrying out simple yet important tasks such as combing the patient’s hair, moisturising their hands and feet or helping with giving sips of water when this is allowed. This all depends on how ill the patient is, and won’t be always possible, but if you want to help in this way, ask the staff. 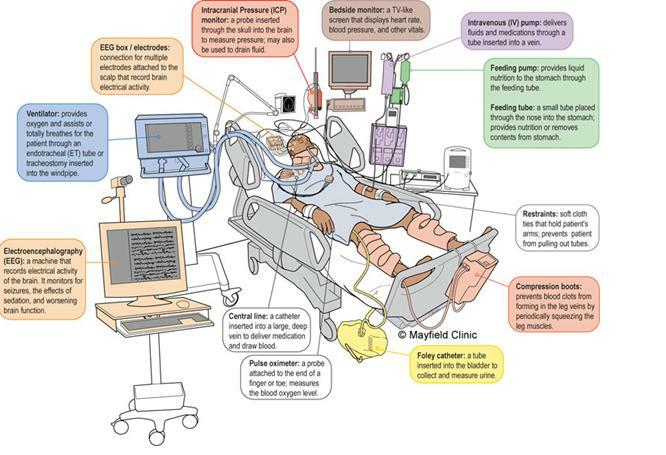 Patients sometimes require a large number of equipment, in order to support normal bodily functions as well as to monitor the patient’s condition. Many machines or pumps have alarms and flashing lights, do not be frightened by these. A ventilator is a machine that assists a patient’s breathing. A tube called an endotracheal tube (ETT) – is inserted through the patient’s mouth and into the windpipe. The machine can ‘breathe’ completely for the patient or it can assist the patient’s own breathing. 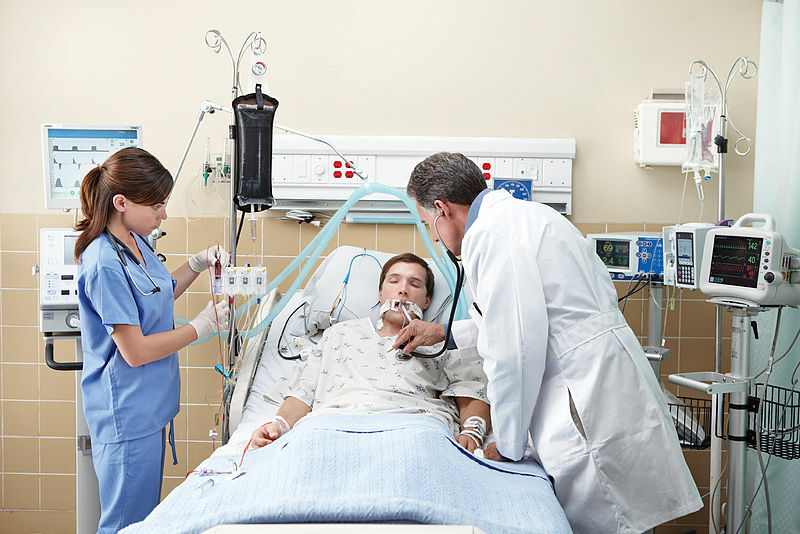 A patient can gradually breathe without the help of a ventilator as their condition improves. If the patient is going to remain on the ventilator for more than a few days, the ETT is sometimes replaced with a tracheostomy. This procedure is usually carried out in the unit. In this case, a tube is inserted into a hole made in the throat. The patient will not usually be able to speak while the ETT or tracheostomy is in place. The nurses have to regularly clear the chest of secretions and fluid and they can do this by passing a very fine suction tube down the ETT or tracheostomy. Most patients will require fluids or medications to be administered through tubes going into veins, usually in the hand or neck. In order, to ensure continuous and accurate administration of fluids and medications, pumps are used. If the patient’s kidneys are working normally the nurses will measure the urine output every hour via a urinary catheter passed into the patient’s bladder. If the patient’s kidneys are not working properly a kidney machine is used to remove excess fluid and waste products, either continuously or for a few hours per day. Each patient is attached to a monitor which would be showing heart rate and rhythm via ECG, breathing rate, and blood pressure. The blood pressure is monitored by inserting a small drip into an artery usually in the wrist. It is also used to take blood tests. A line inserted in a vein in the neck can also be used for giving fluids and medicines. The patient’s percentage of oxygen in the blood is measured by a probe placed on the patient’s fingers or ear lobe. Infection control is extremely important in ITU because patients are extremely ill and can pick up infections very easily. It is essential that all visitors comply with the local hygiene policies. The nurses can advise you on how to adhere to these rules. Strict hand hygiene must be performed. When you walk into the ITU you will find a bottle of hand rub next to the door as well as next to every bed. This is alcohol based and will evaporate. Please use it every time you walk in and out of the ITU. Do not sit on the patient’s bed and leave any jackets or scarves outside the unit. Do not bring flowers/plants in the unit. If your relative is being nursed in a single room, the nurse will instruct you on what you must do. You should not feel guilty that you are not 24 hours a day by your relative’s bedside. You need to give yourself a break and allow yourself enough time to rest. Try to rest as often as you can and remember to eat sensibly. You will need your strength, especially if the patient’s ITU stay proves to be a long one. The staff will contact you immediately should the need for you arise or the patient’s condition change. The hospital usually offers psychological support and counselling, free of charge, in case you feel the need. Leaving the ITU is a positive step and usually signifies that the patient is well enough to be taken care of in the general wards. 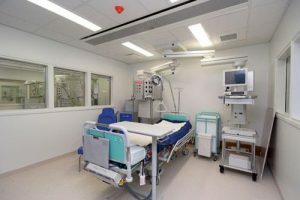 The procedures, the nurse patient ratio and the equipment on a ward are less when compared to the ITU because the patient no longer needs such close monitoring. This more normal atmosphere is a vital step towards recovery and rehabilitation. It is important to note that often patients do not remember being in the ITU. They might have fragmented memories of the machinery, noises and machinery, which might make them agitated and confused. The day-to-day diary might be of help as well as reassuring them and supporting. Critical illness can leave patients feeling very weak and it may take them a long time to recover their full strength. In addition, following an ITU stay, patients may have anxiety, depression or post-traumatic stress disorder (PTSD). In some cases, despite our best care and efforts patients die. This might be sudden and unexpected, but more often than not there would be signs that the patient is not responding to our treatment. In these cases, ITU staff would have had time to prepare you for the eventuality that your loved one might not recover. We are here to support you during these difficult times and you will be offered spiritual and psychological support. If you need assistance please let us know. Arterial line: a drip inserted into an artery that allows continuous blood pressure monitoring and frequent blood tests. Central line: inserted into a large vein that allows continuous fluid and drug administration. It is usually placed in the neck, upper chest or groin. Endotracheal tube: a tube inserted into the patient’s mouth into the windpipe. It is used to deliver oxygen to the patient’s lungs and remove secretions. Dialysis: removal of toxins when the kidneys are not working normally. Inotropes: medications given intravenously (usually through the central line) that are used to support the blood pressure and the heart rate. Nasogastric tube: a tube inserted down the nose or mouth, down the food pipe into the stomach. It can be used to deliver food or medication. Non-invasive ventilation: a tight-fitting face mask attached to a machine that helps with providing oxygen to the patient’s lungs. Pulse oximeter: A probe placed on the patient’s fingers or ear lobe, which measures percentage oxygen in the blood. Sepsis: the body’s response to a serious infection. Tracheostomy: an opening into the patient’s windpipe (in the neck) through which a tube is inserted. Sometimes inserted when patients have been intubated for 7-10 days. Vascath: a tube inserted into a large vein and is used for connection to a kidney machine. Ventilator: a machine capable of providing assisted ventilation. Urinary catheter: a thin catheter inserted into the urinary bladder in order to measure urine output.